Amy Laura Davidson has been practicing labor law since 1980. Prior to entering private practice, Amy served as an administrative law judge for the Labor Relations Commission for eight years where she enjoyed the unique vantage point of an adjudicator. The lessons learned there continue to serve her well as an advocate. After leaving the Commission, Amy worked as in-house counsel to the National Association of Government Employees/International Brotherhood of Police Officers for a couple of years. Her journeys ultimately lead to Sandulli Grace in 1992. She became a partner in 1993. Amy has been representing police officers, fire fighters, teachers and other employees since 1988. She works vigorously to get the best results for her clients through negotiation and litigation. She has represented clients in front of state and federal labor agencies, at arbitration, in contract negotiations, and in state and federal court. Amy has a keen interest in all issues surrounding the provision of health insurance, a crucial employee benefit. She has been challenging cutbacks in insurance on behalf of clients since 1990 and has prevailed in every case she litigated. She also has been engaged in countless negotiations concerning insurance benefits, on behalf of individual unions and in coalition bargaining. 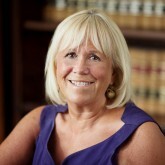 Amy has served as co-chair of the Mass Bar Association’s Annual Workshop for Public Sector Labor Relations since 1998. She was a member of the MBA Labor Liaison Committee that was instrumental in the enactment of legislation in 2007 designed to improve the efficiency of the Department of Labor Relations and the JLMC. In 2008, Governor Patrick appointed Amy to the Department of Labor Relations Advisory Council, a tri-partite group that oversees the operation of the agency. She served as chair of the Council from 2010 to 2013. Amy has led educational seminars at the Professional Firefighters Biennial Convention, the Massachusetts Teachers Association’s Annual Leadership Conference and MassCOP Educational Seminars. She also has lectured before annual meetings of the New England Consortium of Labor Relations Agencies. In her spare time, Amy liked to run, spin and recently has taken up boxing. She completed ten marathons; four in Boston, four in New York, the Maine Marathon and the Marine Corps Marathon. She lives in Cambridge with her husband Gene and their three dogs.